Kalpen Suresh Modi was born in Montclair, New Jersey on April 23, 1977. He attended the Freehold Regional High School District’s Performing Arts High School, as well as the Governor’s School for the Arts, and received a degree from the prestigious School of Theater, Film and Television at UCLA. Kal is probably best known for playing the role of Kumar in Harold & Kumar Go to White Castle, Harold & Kumar Escape from Guantanamo Bay, and a Very Harold & Kumar 3D Christmas. His other notable feature film credits include Mira Nair’s film The Namesake, based on the best-selling novel by Pulitzer Prize-winner Jhumpa Lahiri; Van Wilder and its sequel, The Rise of Taj; A Lot like Love; and Superman Returns. 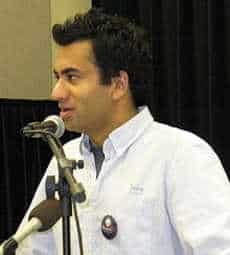 Kal Penn speaking at a rally for President Barack Obama at the University of Maryland’s Nyumburu Cultural Center. In 2009, Kal took an extended sabbatical from acting to serve as the Associate Director of the White House Office of Public Engagement. During his tenure with the Obama Administration, he’s handled a variety of roles, including that of the President’s Liaison to the Arts Communities, Young Americans, and Asian Americans & Pacific Islanders. Here, he talks about being back in front of the camera to -make his latest movie, Bhopal: A Prayer for Rain. Kal Penn: Thanks for having me! KW: What interested you in Bhopal? KP: The script was the first thing that drew me to the project. I was generally familiar with the real-life incidents upon which the film is based, but reading the first draft of the script, and realizing that the complexities resonated with me was the first draw I’d say. Sitting down with the director, and hearing his passion for the project was the second. And of course, it didn’t hurt that Martin Sheen was already attached. He’s incredible! KW: You were just a child when the accident occurred. Do you remember hearing about it at the time? KP: I do, vaguely. I also recall studying it in a few classes in college, but I wasn’t familiar as intimately as when we started researching for this project. KW: Writer/director Ravi Kumar says the film is a work of fiction, ostensibly inspired by Sanjoy Hazarika’s book “Bhopal: Lessons of a Gas Tragedy.” I know your character, Motwani, was based on a real-life reporter, but what about Mischa Barton’s, Eva? KP: You know, aside from Motwani, who’s based on real-life journalist Rajkumar Keswani, I’m not certain which other characters were specifically fictionalized and in which ways. Good question. I’ll ask our director this weekend! KP: I think with any film, first and foremost, you want the audience to be drawn to the complexity and depth of the characters and to remain engaged the whole time. Earlier screenings have had people leave crying, engaged in intense conversations, and asking each other some really fascinating questions. So I feel like I hope that continues, that a film like this of course is entertainment, but that it goes beyond that and sparks the kinds of conversations about relevant, tough issues. I love when art has the power to do that, and I think our writers and director have crafted a film that walks that line. KW: Editor Lisa Loving says: Kal, the last time Kam interviewed you, you said that Harold and Kumar Escape from Guantanamo Bay, a film in which you essentially joked about the Guantanamo Bay prison camp and where you smoked pot with President George W. Bush, involved no political statement. Is the same true of this film? KP: Ha, ha! Good question. I think an entirely fictionalized buddy comedy is very different than a fictionalized tragedy adapted from real-world events, so I would say this is pretty different. I don’t know that there is any political statement being made by the film, that would probably be a question our writers and director would be best suited to answer, but from my perspective, I think this film touches on the multitude of factors that went into such a devastating disaster. We don’t look at “Bhopal” through a singular lens; we approach it from different characters and perspectives. So, I hesitate answering this as a “yes” or “no.” I think the story explores everything from corporate greed to government corruption to environmental and medical regulations to jobs, economy, human rights, and family. Inherently, it explores factors that are political, social, and humanitarian, but I don’t know that it’s making any particular political statement per se. KW: Hirangi Patel says: Huge fan here! How did you prepare for a historical film which reflects such an integral part of India’s history? KP: Thanks, Hirangi. Most of the historical and contextual prep for the overall film was of course done by our writers and their research years before actors are attached. From the actor’s perspective, working on everything from dialects and language to looking at archives and information from the Eighties played a role in developing my character. KW: Sangeetha Subramanian says: Kal! You were in two of the three films I organized at the Rutgers South Asian Film Festival in 2006 including Cosmopolitan and American Made. What is your advice for South Asian American actors/actresses trying to break in the industry? KP: Thanks Sangeetha. I think my advice for any actor would be to be as trained as possible, and to not take “no” for an answer. There are so many more opportunities for performers of color now than there were 10 years ago, and there will be more 10 years from now. So many incredibly talented writers, directors, and filmmakers are emerging on their own shows, plays, and productions. KW: Editor/Legist Patricia Turnier asks: Was your film translated into Hindi and how was it received in India? KP: The film is going to be translated into multiple languages from what I understand. It releases in India on December 3rd, followed by Singapore and several countries in Europe. KP: “Nothing to Envy: Ordinary Lives in North Korea“ by Barbara Demick. KP: I’m not allowed to wear gym shorts with an old tee shirt on the red carpet. KW: Thanks again for the time, Kal, and best of luck with Bhopal and in the White House.